Went to The Body Shop Atrium Sale and picked these up. Wanted to stock up my Tea Tree Oil Facial Wash as it's running low. Luckily they have it. It's a full size. I think it can last me a while. Oh, and Wild Cherry smells wonderful. I thought Passion Fruit was nice but Wild Cherry is way better. Can't wait to use it. I don't find their shower gels particularly moisturizing or whatever. I just love the scent. Currently using the Strawberry Shower Gel, which just keeps me happy everyday. And I miscalculated so my purchases weren't over $30 so I didn't get the stamp. Boo. 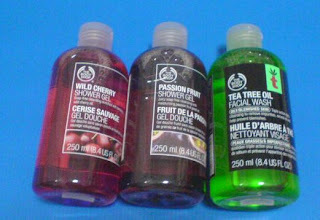 If you are a The Body Shop member, you would know why you get obsessed with their products. Their membership and "collecting stamps" system makes you addicted to buying them whenever you see a sale. I'm lemming for something from their Hot Brights Summer collection. Waiting for a discount in stores or a voucher to drop my way.